InterSense partner Animazoo delivers the IGS-180 motion capture solution for researching the mobility of elderly patients with Parkinson’s disease. A team at the Universite du Quebec a Montreal under Dr Christian Duval and Patrick Boissy Ph.D are working on a project researching the mobility of elderly patients with Parkinson’s disease. The study will provide ground-breaking research results in a number of ways but the key challenge the team face is studying patients’ motion in their homes, for up to 4 hours at a time outside of lab environments. In this environment, the current systems used by the research team (including Vicon, Ascension and Northern Digital Systems) weren’t able to cope. They also own an inertial motion capture system from Xsens / Moven but in tests this was not able to provide the accuracy, reliability and environmental flexibility required for the study. The only system they found to meet their needs was Animazoo’s IGS-180 inertial motion capture system. New magnetic compensation algorithms in Animazoo’s IGS-180 software proved better than expected and by using Animazoo’s SDK, the UQAM team were able to plan all data gathering exactly as they need it and use it in their own analysis pipelines. 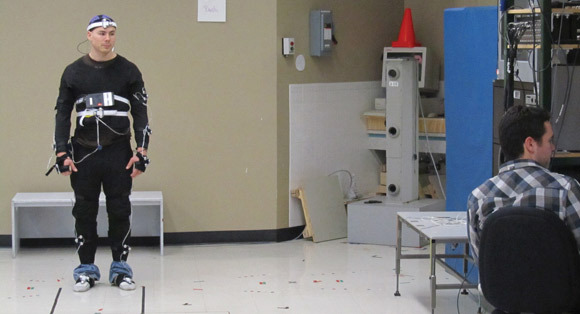 “Animazoo’s attention to details and understanding of IMU-based biomechanics motion capture issues, coupled with their software environment, SDK and willingness to work with us to achieve our goals were deciding factors in our choice of their product for our project.”- Patrick Boissy, Ph.D.